CAUTION: Deleting a process will deleteallevaluations related to that process whether or not the evaluations have been completed. Should you delete the evaluations in error, please contact your FACULTY180 administrator immediately. FACULTY180 will be contacted with the request to restore the evaluations. This should be a rare occurrence. This is not intended to be part of any maintenance plan. There is significant time and effort involved in restoring data. On the Admin tab, click Administration. Click Evaluation Processes in the Evaluations section. The Evaluation Processes - Count by Unit screen displays. 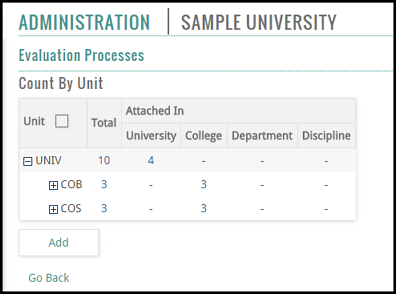 Click the number for the unit associated with the evaluation process you wish to view. The Evaluation Processes screen displays, showing a list of existing evaluation processes and their associated evaluations. Click the delete icon adjacent to the desired process. A message appears warning that any associated evaluations will be deleted. This includes completed, as well as uncompleted evaluations. If you are sure you wish to delete ALL evaluations associated with this process, click the Delete button.